I love Australian beef, however it took me a while to learn which meat cut goes best with which cooking method, as Thailand and Australia have different cuts. I remember when shopping with my husband he told me to look at the price, as the more you pay generally the better quality meat you will get. This meant that I usually I bought steak such as scotch fillet, eye fillet for grilling and gravy beef to make Thai mussaman curry. I find chuck steak is an inexpensive cut, but marinated and grilled or fried it it is just perfect. Here is a dish I like to cook with chuck steak, it is called Nuer tod kra tium. Nuer is a Thai word for beef, Tod is fry and Kra tium means garlic, so this dish is fried beef with garlic. 1. Grind together garlic, coriander root and pepper using a mortar and pestle to form a paste. 2. Coat the beef with this paste then add salt, soy sauce, sugar and oyster sauce. 3. Marinate the beef for at least 2 hours in the fridge. 4. Add oil to the fry pan then add garlic and fry until brown and crispy. Remove the garlic and set aside until required. 5. Add beef to the pan and fry until until brown. 6. 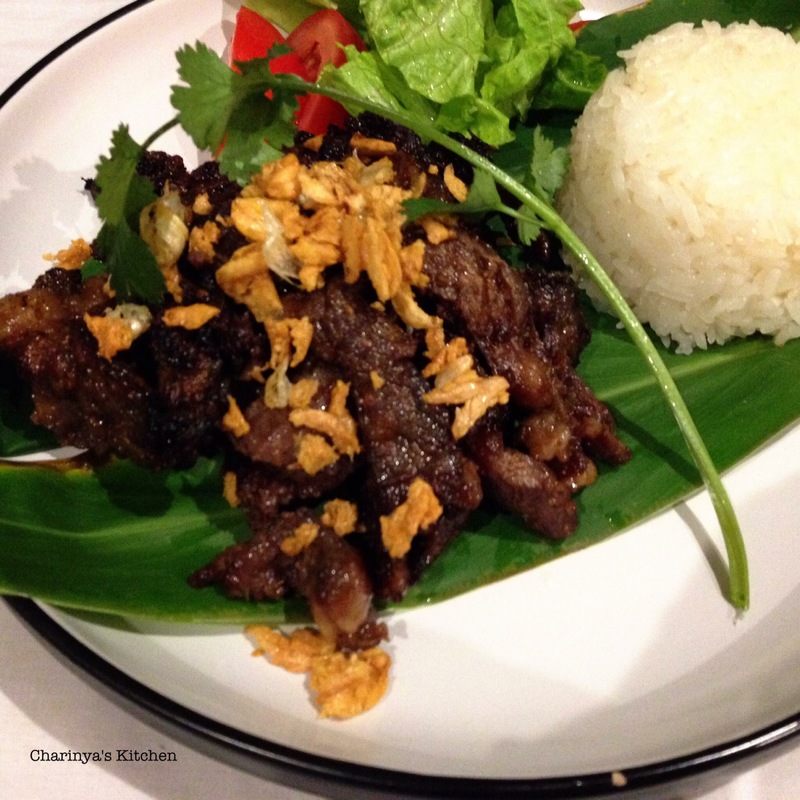 Serve the fried beef with sticky rice and top with crispy garlic. 1. After marinating the beef take a small piece and grill in the fry pan to check its taste and adjust if required. 2. This fried beef does not require an accompanying sauce, but if you want a sauce then Sri Ra Cha sauce or chilli powder with fish sauce is recommended. 3. For those who don’t eat beef you can try this dish with pork or chicken. Enjoy cooking!